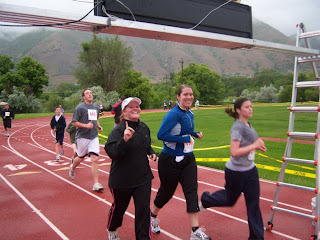 The Springville 5K has been a tradition for about 5 years now. We planned to run it as a family, but the rain put a damper on that idea. So my WONDERFUL husband stayed home with Lucy so I could run it. It was a lot of fun! Thanks Babe! You're so good. How fun. Lucy is so grown up and cute.